We had these nearly two years of spending almost every minute of every day together, living in our quiet, predictable rhythms. As an infant, you clung to me and had little interest in being close to other people, even Daddy at times. Our early attempts at leaving you with a babysitter were traumatic for everyone. You would cry and cry, refusing a bottle. I would sit at my desk, unable to concentrate on my work, and instead checking my phone for text messages from the babysitter. You let me know that you needed me. I accepted this and stayed close. I was nervous about this change, but you love going to day care. You jump right in to play, often only pausing for a quick hug goodbye with me. And when I return to pick you up, you greet me with a grin and a hug, but then you go back to playing and it is often a struggle to tear you away. You embrace your new caregiver as if you have known her all your life. I am so relieved to see that you are comfortable with this change. But it is also bittersweet for me, I admit. It is a LOT of letting go. In fact, you may have noticed that I have been hugging you an awful lot lately when we are together. That’s the only way I can ease myself into the reality of your growing up. But also? It is magical to watch you become your own person. You walk confidently and run joyously. You disagree passionately. Sometimes you are agreeable, but you’re passionate about that, too. You demand band-aids, piggy-back rides, and one more bedtime story. You try new words, first listening, and then testing them out. You pause, you reflect, you nod with understanding. You protest holding my hand as we cross the street. 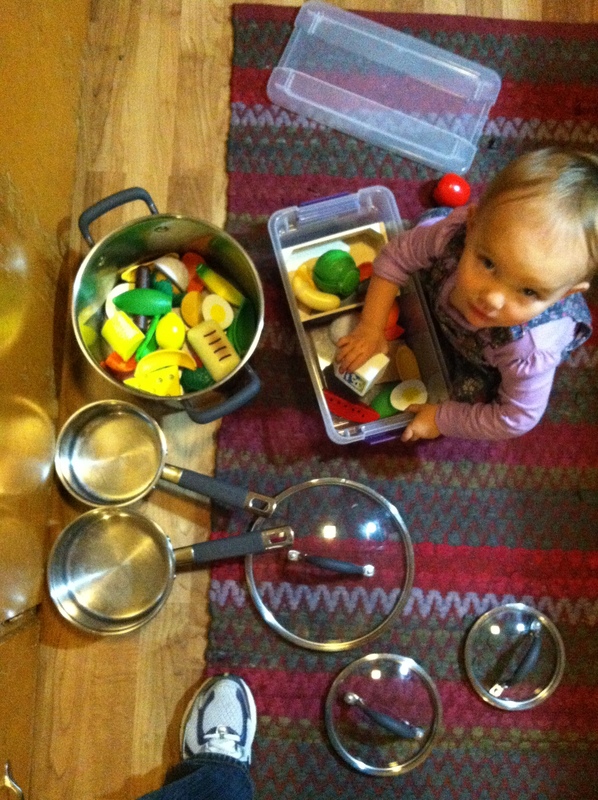 You pretend play – serving me dinner of plastic veggies and grinning as I nibble at them and complement your cooking.